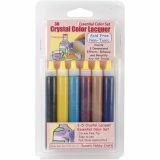 3D Crystal Lacquer Color Pens 6/Pkg - SAKURA-Create 3D effects. Enhance and beautify any art image. 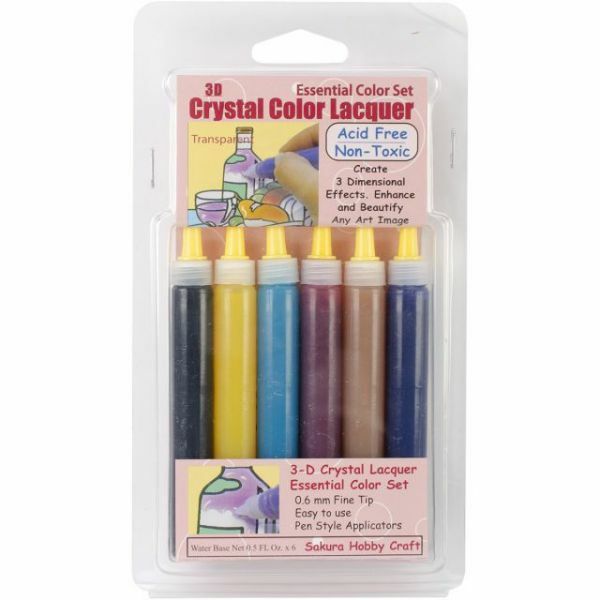 Each essential color has a 0.35mm fine tip, is easy to use, and has a pen style applicator. Water base net 0.5 fluid ounces per color. Acid free and non-toxic. Conforms to ASTM D4236. Adult supervision strongly recommended for usage by children. Allow 15 to 30 minutes for the lacquer to dry before applying more on top. Colors: black, orcher, turquoise, cerise, fawn, and navy blue. Also includes 1 cleaning pin.